Despite the constant airstrikes on its oil infrastructure, ISIS still has a $2 billion empire -- and it's making up lost revenue by squeezing the population under its control through rising taxes. That's according to new research from the Center for the Analysis of Terrorism, which will release on Wednesday a new report on the finances of the Islamic State. The authors of the report, terrorism experts Jean-Charles Brisard and Damien Martinez, conclude that "ISIS's military defeat is not imminent... as things stand, ISIS economic collapse remains some way off in the mid-term." It says ISIS made $2.4 billion in 2015. That's a $500 million drop from the center's revenue estimate the previous year, but ISIS remains the richest terrorist organization on the planet. The main reason ISIS is still making billions is taxes. The Islamic State's extortion of the people living inside its territory in Iraq and Syria has skyrocketed from $360 million in 2014 to $800 million in 2015, according to researchers. The report is a sobering take on what has been an image of ISIS as a terrorist organization in disarray. In recent months, ISIS has cut fighter salaries in half and a nonstop bombing campaign has cut its oil production. It has also lost 40% of its territory, according to the U.S. military, but ISIS still has about 8 million people under its control. Brisard and Martinez say that ISIS has simply adjusted its business from oil to taxes. As oil fell from 38% to 25% of its revenue stream last year, ISIS cranked up its extortion racket. 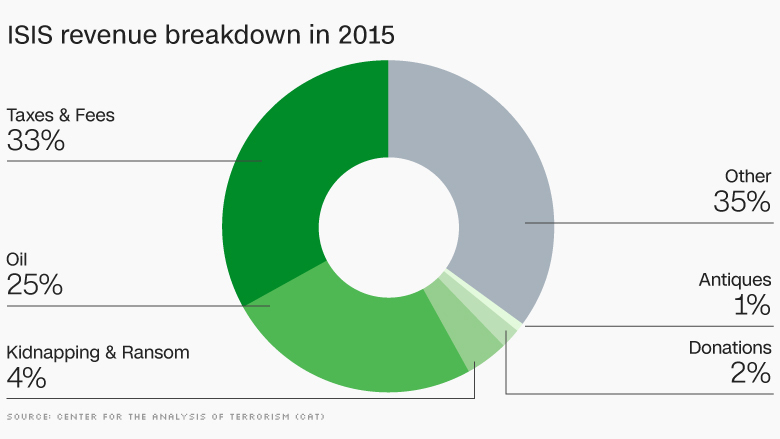 In 2015, taxes went from supplying 12% of yearly ISIS revenue to 33%. Those taxes include a 10% income tax, up to 15% business tax, road tolls, 5% fees for bank cash withdrawals, and up to 35% taxes on pharmaceutical drugs. There are also fees for leaving the territory, even temporarily. And there's a special tax on Christians, mafia-like "protection insurance" called jizyah. The Islamic State's official magazine proudly speaks of "imposing jizyah." ISIS says all taxes are zakat, Islamic religious alms similar to tithing. "It's really an adaptive organization," Brisard told CNNMoney. "What strikes me is the fact that they're clearly behaving as managers, not simple looters. They really have budget requirements, and they're compensating." But the U.S. Treasury Department said the coalition's effort to disrupt the Islamic State's economy is working. The group is also known as ISIS and ISIL. "We are seeing progress... since late-2015, ISIL's production of oil has declined by about 30%. Their ability to generate revenue has been reduced by at least that much," Treasury said. This particular research tends to give higher revenue estimates than those provided by other experts. 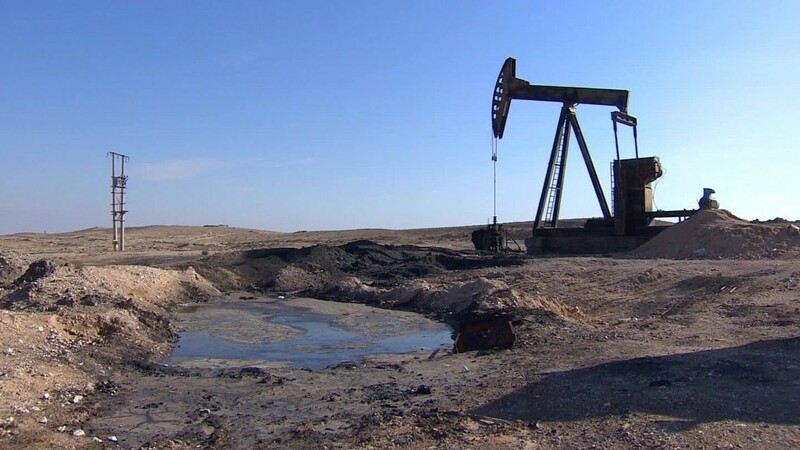 For example, it says ISIS made $600 million from oil last year while the U.S. Treasury has previously estimated that it's closer to $500 million. But several other terrorism experts say the main conclusions are still accurate: ISIS has flipped its budget. The Geneva Centre for Security Policy will publish a report next week that details how ISIS has come to rely on taxes to fund its terror. Christina Schori Liang, a terrorism analyst there, said that ISIS is eying illicit profits from cybercrime as the next frontier. It's harder to track, allows for the use of digital currencies like Bitcoin, and doesn't abide by international banking regulations. 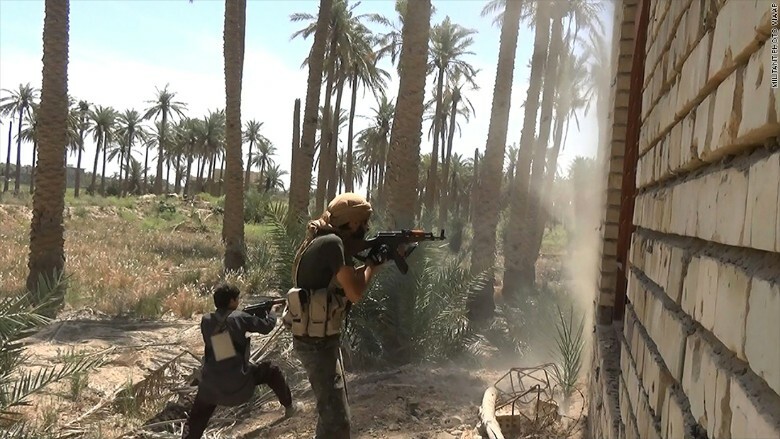 The report by the Center for the Analysis of Terrorism claims that ISIS still has an immense trade with the outside world, because the United Nations has failed to close off its territory with a formal embargo, and American coalition airstrikes have limited impact on the economy. Brisard acknowledged that airstrikes have destroyed much of the Islamic State's oil-producing infrastructure. But he said the only way to truly cut ISIS funding is to recapture the territory it controls. ISIS is besieged on several sides by troops from the Russian-backed Syrian government, U.S.-backed Kurds and other rebel factions, but the United States and Russia have shown no indication they are willing to commit their own military forces. What surprises Brisard the most, however, is that the countries sitting on the UN Security Council can't agree to an embargo that punishes countries that continue buying cement, wheat, oil, phosphate and other products from ISIS territory. For example, research estimates that ISIS sold 12,000 tons of cotton last year -- mostly to buyers in Turkey. "The current situation is absurd," Brisard said.